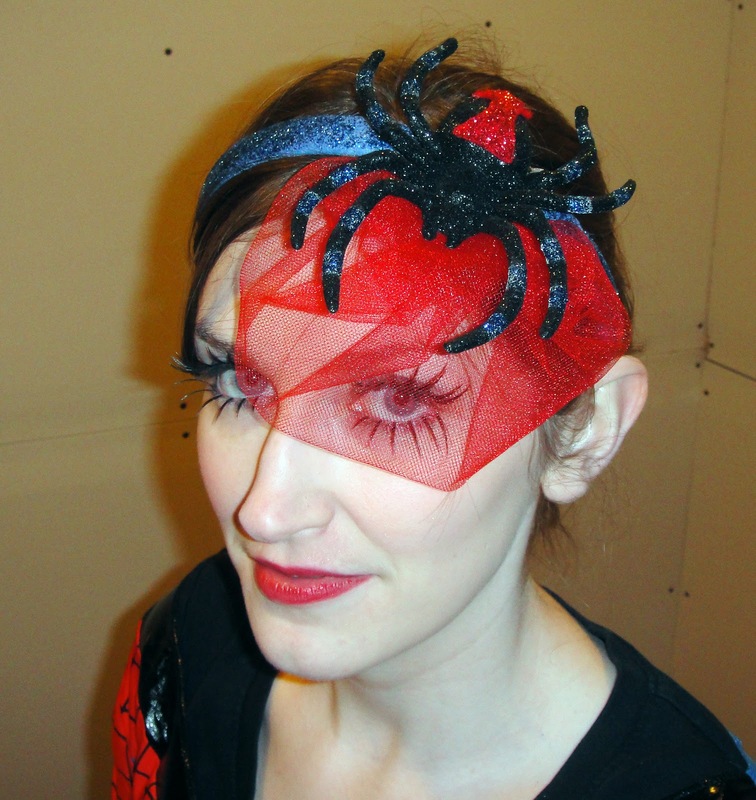 BiblioBags: Where Every Purse has a Story...: Along Came A Spider . 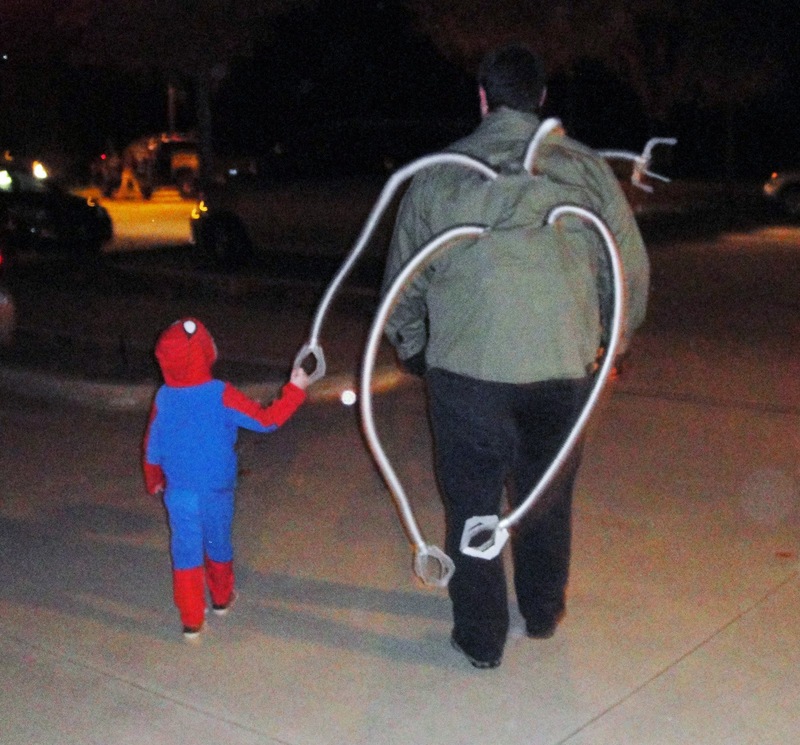 . .
Wednesday night was Trunk or Treat, our church's annual Halloween party. We always go overboard on our costumes . . . I wind up stressing myself out trying to get it all done but every year I'm glad I did! Our little man picked our theme: Spiderman! The irony? His was the only getup that required no crafting on my part. I got to be Spidergirl! I found the dress (normally $50) for $9 on eBay. I'll never buy a new costume again! I realize I look more like an ice skater than a superhero, but I still think it was cute. Yes, it's more drag queen than Duchess of Cambridge but I still love it. It was super easy, too! I started out with this glitter spider clip from Undead Pinups (best shop name EVER) on Etsy. I added blue glitter glue to the silver stripes. 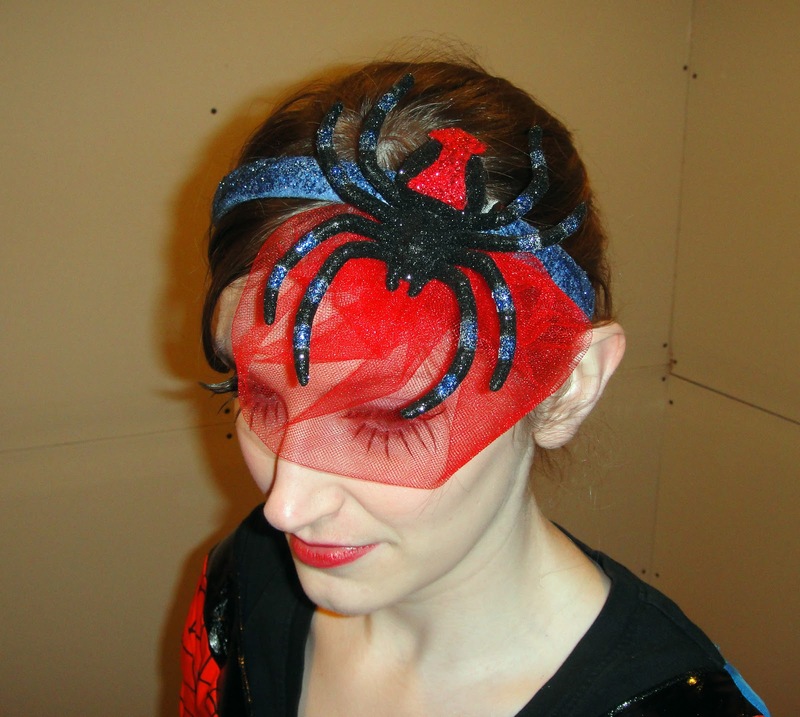 I cut a black widow symbol out of red felt and coated it in red glitter glue, then attached it to the spider's abdomen with hot glue. Next, I covered a headband base with blue felt and coated it in blue glitter glue. I cut out about a 12 x 12 inch square of red sparkle tulle and folded it in half. I gathered the cut ends, making the tulle into a half circle. I hot glued the cut ends to the underside of the headband. I cut a slit in the felt on the headband and slid the clip inside, and hot glued it for stability. And, there you go! 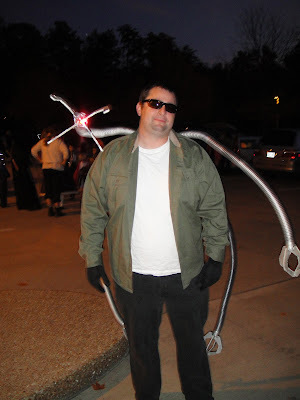 Next up was my hubby's costume: Doc Ock, or should I say Doc Ick. 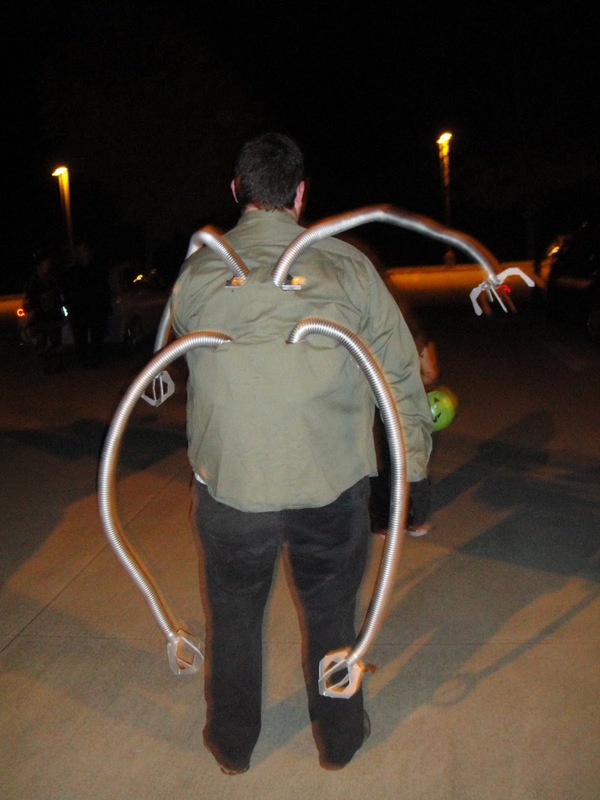 This costume gave me such a headache! 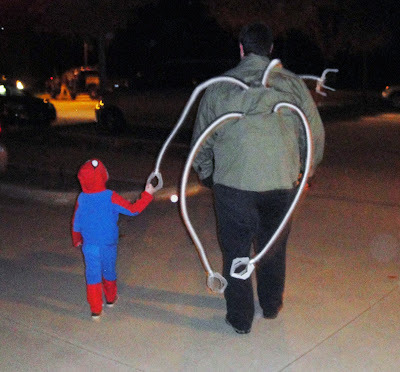 We made the arms from vacuum hosing (at Home Depot for around $10) and wire hangers. I made the claws from foam core and attached them with hot glue. The Hub was insistent that the open claw had to have a light in it, just like in the movie (Spiderman 2). He found an LED light at Radio Shack for $1. I stuffed it in the tube, glued it and duct taped it into place. We couldn't find a trench coat, so he just bought a shirt and I think it still worked fine. The Hub made a harness out of an old backpack and a metal grill. I ziptied the arms to the grill and there you go. Doc Ock. My hubby is very shy but he likes to get into Halloween. He got a lot of attention and compliments at the party . . . I could tell he was really excited with how it came out. That is so awesome! I love that you go all out. I keep telling myself that I will go all out next year. It ain't happening this year, so I guess it will be next year again. :) I really do want to do the whole Labrynth thing someday, so let me know if you have any ideas.